Coral larvae disperse with ocean currents and need to find a suitable substrate to settle and undergo metamorphosis to the primary polyp. In the natural environment, coral larvae use a myriad of complex cues (such as light, sound, surface texture, and chemical cues) to choose where on the reef they will settle and live, potentially for hundreds of years. For restoration using larval propagation, the successful settlement of new corals onto the reefs is critical for encouraging reef recovery. Encouraging settlement of cultured larvae is commonly done in two ways: directly onto the reef or onto artificial substrates for later outplanting. Careful thought and planning are required to choose and prepare appropriate settlement substrates. Commonly used substrates include terra cotta or limestone tiles, ceramic plugs, or designed concrete units. Generally, factors that are often attractive to coral larvae include 1) biofilms and (some not all) crustose coralline algae (CCA) and 2) dark or cryptic surfaces or ‘nooks and crannies’. Biofilms and CCA – This is generally accomplished by ‘conditioning’ substrates in raw seawater, preferably in a reef environment, to allow cueing organisms to colonize the substrate surface and mimic the natural ‘smells’ of coral reefs. However, more conditioning is not always better, as organisms like algae, sponges, and worms can also colonize substrates and compete with or prey upon newly settled coral larvae. 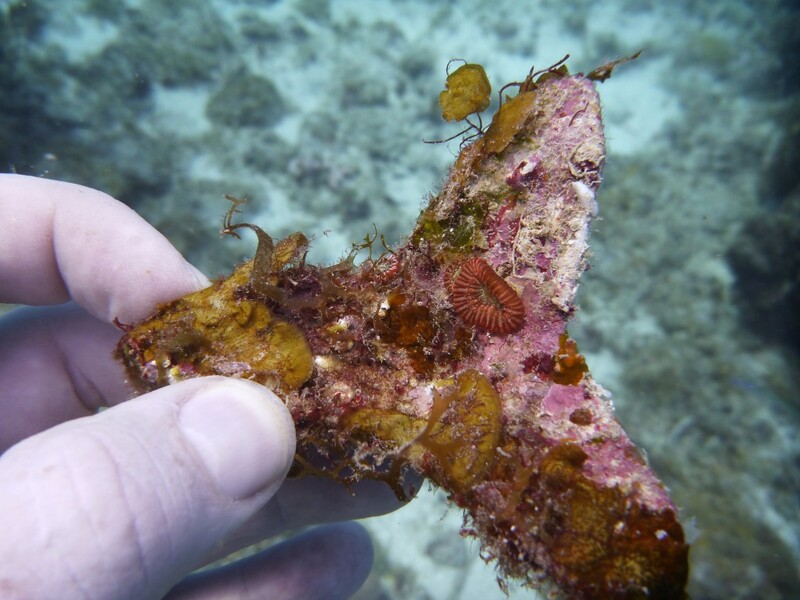 It may be possible to circumvent the need for conditioning if a separate source for favorable crustose coralline algae can be identified. If a source of facilitating CCA is readily available (e.g. in a land-based culture facility), it can be collected, ground to small dust or powder, and placed on unconditioned, smooth settlement surfaces. However, CCAs are difficult to identify. Most spawning corals do not inherit symbionts from the parent and must acquire them from the environment after settlement. Thus, if settlers will be kept in tanks for an extended grow-out period, a few pieces of reef rubble or sand (or other captive coral colonies) can be placed in the tank as an inoculant source of symbiotic algae. Dark and cryptic surfaces – These are generally incorporated in the substrate itself. Settlement on an intended surface of any given substrate type may be encouraged by presenting it in an upside-down position. Also, if substrates are conditioned in the field, it may be advantageous to place them in a shady position such as under an overhang, or even placing shades over the crates containing the conditioning substrates. Reducing light can also reduce the amount of algal growth. With good conditions, larvae often settle in dense aggregations, which does not represent the most efficient outcome as it can reduce survivorship rates. For restoration, the goal is to provide substrates that attract moderate levels of settlement to improve efficiency, while providing an optimal habitat for the settlers to grow and survive. An appropriate goal for efficient restoration is to have a final yield of one surviving coral per substrate unit to be planted onto reefs. The ‘ideal’ density of settlers starting on each substrate unit to yield a single survivor is not known, but previous projects suggest densities around 10-50 settlers per substrate is appropriate. Settlers should be left undisturbed for 1-2 weeks to firmly attach and begin skeletal deposition. Settlers can then be counted, either using a microscope or by eye with the aid of blue lights (as coral tissues often glow green under fluorescent light making settlers more perceptible). The settlement substrate constitutes both a ‘vehicle’ to deliver baby corals to a reef as well as the initial habitat of the coral. Thus, it serves both an engineering and ecological function, and great advances in coral restoration efficiency could be gained by improving the designs of substrates. This is a focal aspect of restoration research by SECORE, aiming to improve substrate design in terms of efficiency of handling, deployment onto reefs, and fostering better post-settlement survivorship. SECORE shares this technology with qualifying organizations; contact them for further information. 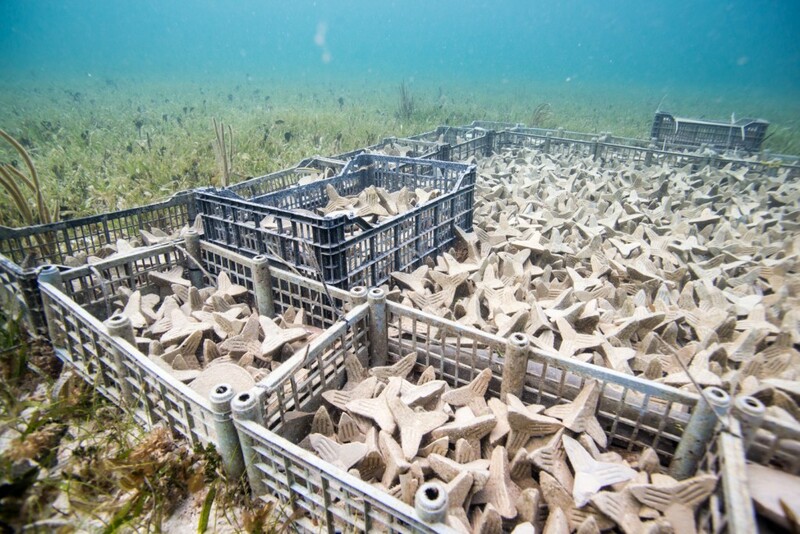 Coral that have successfully settled onto artificial substrates like tiles or tetrapods will next need to be outplanted onto coral reefs to aid in coral recovery. This step requires substantial planning and preparation to choose and condition substrates. More conditioning is not always better as it can lead to more competition for newly settled corals. Test your understanding of the information in this section by taking the quiz. This content was developed with SECORE International. For more information, contact info@secore.org or visit their website at secore.org.